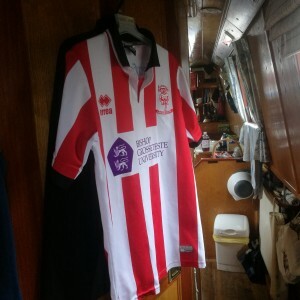 Narrowboating Chick | Major disappointment and back the way we came. Major disappointment and back the way we came. Up bright & early this morning ready to be the first boat on the flight- 3 and a half hours seems to be the norm, we would like to try to do it a bit quicker. With much anticipation, we set off, but it was not to be- we had hardly got out of the Stoke Bottom Lock when someone at the boatyard told us that the Tardebigge was indeed, closed. Marcus called the BW boatyard for some idea of the length of time of the closure, but it was likely that the canal closure would be at least 3 days. Needless to say, we were all so very, very disappointed and faced with the option of coming back the way we have just come from, albeit with a slight diversion into Worcester. The glorious Tardebigge that was just out of reach today. However, closed means closed and we reluctantly turned round (well, I actually executed that nifty manoevre!!) and headed back down the W&B. The weather was glorious and once through the Astwood flight (again!!) it was rather glorious cruising weather, so not all bad. As an added bonus, Marcus made Bacon & Egg sarnies- OMG, how delicious were they??? I even managed to steer & eat at the same time-did not want those yummy sarnies go to waste (just waist!!). I can reluctantly admit that the cruise down to Worcester was fun and enjoyable & we reached the city at about 3pm. On the way, James and I fished a football out of the canal- Marcus was down at the next lock, so it was just us- Aqua Roma behaved perfectly and did just as I asked, even when I had to leave the tiller to retrieve the ball, as James was just a little too short to reach over the front. I was just glad that no one was behind us, as although my boat handling was quite good, it took a while longer than if it was Marcus steering. The sun was glorious and the people were starting their weekend early by drinking in the pub gardens & on the riverbank. Both Marcus and I found the city very crowded, having been away from civilsation for 3 days!! A quick pit stop and a Wetherspoons and a trip to the park was a pleasant way to spend the evening. All in bed by 9pm, just glad to be horizontal and resting our weary bones! We’ll head back up the Severn tomorrow and see what time we get to Stourport- We could possibly divert into Birmingham at Stourbridge- we’ll see what the time is like. Heavy Wide Locks and Can we get to the Bottom of the Tardebigge?